4 Prong T-Nuts can be used in hard and soft woods. Also available in Hopper Feed style for labor-saving automation. 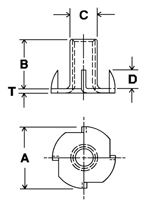 F20 suffix indicates a larger flange. SS suffix indicates Stainless Steel.